Here you will find some of my favorite and more memorable wedding guest book ideas used in past projects. Though I can't take sole credit for their ideas, some of my clients have designed some truly unique and beautiful custom guest book puzzles. I hope these help you find a little inspiration if you need it, but as always feel free to contact me if you need help with your own idea or want to share your own story about how you used your own wedding guest book puzzle! Mary's puzzle will always hold special meaning to me because it was the first wedding guest book puzzle that I had been asked to produce. Her sister reached out to me, and to quite honest I had a difficult time understanding her request. After several discussions, we agreed on a photo guest book puzzle which included a heart shaped "puzzle within the puzzle" shown on the right. The puzzle was a big hit, and after several referrals from Mary's wedding I began to market my guest books online. After 6 years I now only focus on producing guest book puzzles, and have been blessed to have had my guest books be a part of almost 500 weddings to date. In 2014, Renee and Damien faced a common issue many client's experience when designing their guest book. The photos that they really wanted to use were not taken by a professional photographer and could not be enlarged with any real degree of image quality. The photos they submitted were taken with a smart phone, so special care had to be taken to maintain the highest quality image possible. Fortunately their wedding did not require a high piece count, so we were able to design the inlaid photo guest book puzzle shown to the right. For more information covering image requirements for my wedding puzzles, visit the selecting a photo for your guest book page. I always enjoy when clients request unique shapes for their guest books. Though they don't always make sense to utilize in every situation, occasionally they can make a project stand out from the rest. Typically they are only advised when ordering blank guest book puzzles, they have a limited place in other product lines. The puzzle shown on the right was made in the shape of Australia, and featured a simple figural design using the wedding date and the initials of the couple to be married. Guest book puzzles are also a great gift for anniversary celebrations. 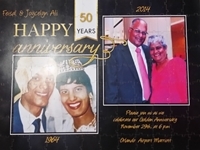 The puzzle to the right was ordered as a surprise for a couple celebrating their 50th anniversary. Like most other couples celebrating a 50 year anniversary, images from that time period are usually low tech and are not the best candidates for enlargement. Because of this it is often customary to use multiple images to form a collage. My wedding puzzles are typically only used as a guest book, but occasionally I have requests to design a puzzle used during a wedding proposal. Usually the client asks me to include the words "will you marry me" on a single piece, which is usually hidden until the rest of the puzzle is assembled. In this particular case, I was asked to seperate each word into it's own heart shaped puzzle piece. They are generallysmaller than my larger guest book puzzles, with an average of 40-80 pieces per puzzle. 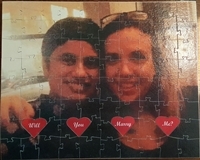 Typically priced at around $1 per puzzle piece (plus shipping), my proposal puzzles are a very affordable way to pop the question to that special someone in your life. Please note that these items are not part of my usual product line, so you will need to contact me to request a custom quote. Ordering a guest book puzzle for your wedding, or as a gift for someone special is made easy by my automated ordering system. Throughout the design process you will be taken through each step one at a time to create your own unique wedding puzzle. The first step will gather basic information about your guest list in order to properly size your puzzle, then walk you through all the custom options available. To learn more about the custom options available, visit the guest book puzzle page. To jump ahead and design your own guest book puzzle, use my design tool shown on the right. Best wishes, and I look forward to being part of your wedding day!